So. This post is all about technology. This post is all about how I hope that something I did will generate huge traffic and lots of buzz for Chickenblog, and that I will finally take that call from Terry Gross and earn more than $00.08 of revenue from Google hits. Sure, I blog for the love it, for the purity of the process, but come on! Don't think for one second that cash and book deals would offend me. We have mouths to feed! In the Kingdom of Blogosphere there are Queens, women whose blogs reign supreme in popularity, finesse, ad revenues and enviable success. I was visiting one such blog and found a link to Hewlett-Packard and their HP Makeover Contest. At first I was like ¡Wow! A makeover! I totally need a makeover. My feet look like Medieval peasant feet and I'm not sure how I am feeling about going gray naturally. Turns out the makeover is for computer equipment, copiers etc. Cool. Maybe I can digitally color my hair. So, to make a short story long, I entered the contest, submitting a 200 words or less story about How Technology Has Simplified My Life. My children are the ones that really know about technology. They blow me away. They amaze me. They are so clever and creative and inspiring. William has this tremendous patience and wonderful ability to share what he knows without being condescending or too technical. 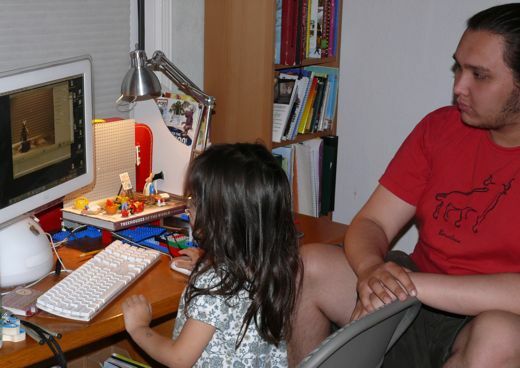 Using correct terms, he patiently guides Maria through Spore and he's taught her how to use tools in 3-D Studio Max. Most recently William sat with Maria and together they made a stop motion animation. 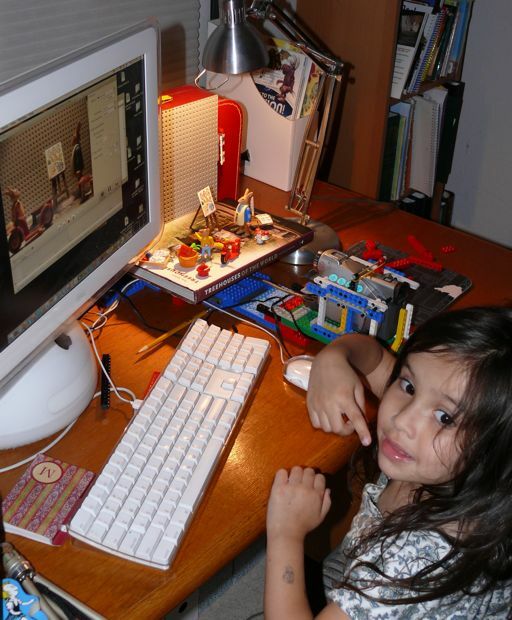 She chose to use her Playmobile figures, and in no time at all she was independently operating the camera, using the computer and moving her characters. She made a movie! And can you see the camera hidden in the Lego contraption? That is a special stabilizing dolly that William designed and built. It keeps the camera in the same place between shots and it moves with the soundstage. Very cool innovations. Seriously. My children, my husband, my ridiculously abundant fabric stash... these are the things that matter most in my life, so really there is no cause for disappointment, no excuse for whining. But I do have wishes and dreams, and I am hopeful that somehow I can do more to support this great family, to ensure our security and provide more opportunities, and to buy a frickin' house. Is the path through Chickenblog? Through online contests, ad revenues, wishful thinking? Maybe not. Maybe not if I don't have the savvy to include my blog name and a link in my 200 word HP blurb! Honestly, what was I thinking? "Natalie Chickenblogger?! From this I thought something would happen? Good grief. What a poser. That video looks really cool. Will you post it when they're done? Good luck with the contest. How fun... I sometimes find me entering contests and then thinking "why did I do that...?" too. I like your picture, and the little essay was a neat summary. I hope you win! Wow, cool! You're not a poser at all. We love keeping up with what you're up to. hey, i am new traffic here! but i found you through soule mama. looks like we share interests and location. loved your beach tips in her comments today. thanks! I'm new to your blog, too! Always great to meet another friend of chickens!! And I'll go ahead and admit it - I'm not that crazy about geraniums either. You're right - they just don't smell good. But more than that - they don't like me - I never have good luck with them, even though I give it a try every year! That is so cool!!! Love your picture on the HP site. I think your essay sounds real nice! Good luck! Keep entering...I have won a few really cool things in the past...someone wins those things! I too would like to see the stop motion movie! Sounds awesome! Thanks for being a real blogger. Doing it for the love of the game. It makes me feel better about not making much money with mine right now, either. Thanks for posting!